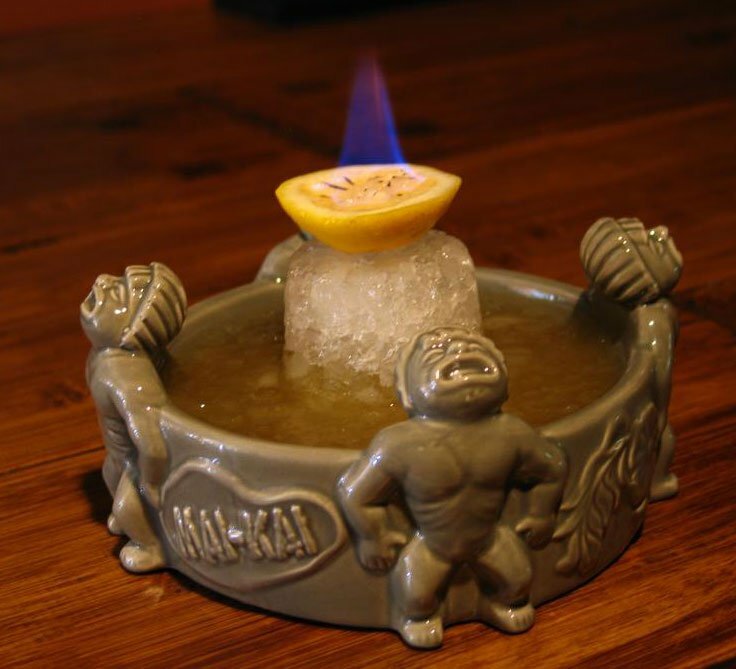 There are few drinking vessels with the mystique of The Mai-Kai’s famous Mystery Bowl. The iconic communal cocktail popularized at the Fort Lauderdale Polynesian palace has been celebrated for a half-century by everyone from Johnny Carson to today’s Tiki revivalists. Sure, there’s nothing like the unique experience of enjoying this giant drink with friends in the The Mai-Kai’s hallowed bar and dining rooms. At the sound of a gong, the distinctive bowl is delivered by a sarong-clad Mystery Girl, who does a traditional Polynesian dance and rewards the lucky recipient with a lei. The drink itself remains a mystery, a giant 50-something-ounce concoction of fruit juices, rum, and other liquors. 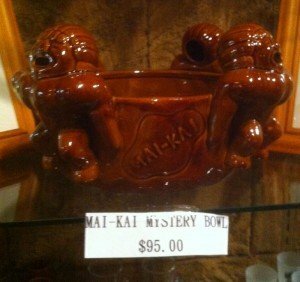 But true Mai-Kai nerds long for an authentic Mystery Bowl of their own. The older version made by Dynasty and the current version made by Tiki Farm occasionally pop up on eBay for more than $100. And they also appear in The Mai-Kai gift shop from time to time (see photo above), typically priced just below the century mark. But beyond the price and availability of the authentic bowl is the issue of its practicality. Even the most hearty tropical drink enthusiast would be reluctant to use this puppy as a day-to-day Tiki mug. You’ve got to be pretty thirsty, or have a nearby gang of like-minded imbibers, to regularly take advantage of this big guy. Into this void enters the very practical and nearly-as-authentic Mini Mai-Kai Mystery Bowl from Swank Pad Productions. It’s 6 inches wide, 3 inches tall and clocks in at 12 fluid ounces, plenty big enough for a typical high-octane Tiki drink (around 6 ounces) plus ice. And at $39 (plus shipping), it’s not far off the going price of many of today’s custom mugs. You can also save the shipping charge by picking up one of these little guys in The Mai-Kai’s gift shop (see photo at right). It looks like two Mystery Bowls got together in the back room during the Polynesian dinner show fire dance and ended up with a spawn of little offspring. The attention to authenticity in the product is due to the reverence and diligence of Swank Pad founder and unofficial Mai-Kai historian Tim “Swanky” Glazner. He spent years in research and development, unveiling the more elaborate Mai-Kai Mystery Girl Bowl at Hukilau 2011. This new, smaller version of the famous Mystery Bowl is produced under license from The Mai-Kai from a complex five-piece mold, just like the large version, but in a souvenir size. It’s designed after the original 1959 version of the Mystery Bowl and even includes an inner ring for an ice volcano (see photo at right). Based in Knoxville, Tenn., the 48-year-old Glazner is a longtime Tiki and mid-century enthusiast. He was co-founder of The Hukilau, the annual gathering that will return to Fort Lauderdale and The Mai-Kai in June 2013 for its 12th installment. (Co-founder Christie “Tiki Kiliki” White assumed full control of the event in 2006). Glazner has turned his attention to other interests, such as creating The Grogalizer (the essential database of cocktails found in Jeff “Beachbum” Berry’s many books), a Tiki-themed calendar and puffer fish bar lamps. Driven by a dedication and determination to document the history of the 55-year-old landmark, he has unearthed a treasure trove of information and memorabilia. Glazner also has met and befriended many former employees who helped shape the restaurant in its early days under its late owners, brothers Bob and Jack Thornton. 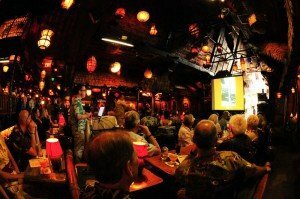 The culmination of his research to date was a fascinating multimedia symposium, “Mai-Kai: History, Mystery & Adventure,” at The Hukilau in April. Hundreds of reverent tikiphiles and dozens of current and former employees were riveted by his slideshow and commentary on the mid-century heyday. The highlight was the showing of a 1962 video clip from The Tonight Show that had not been seen in decades, if ever. Johnny Carson and sidekick Ed McMahon were frequent Mai-Kai patrons, and they were particularly fond of the Mystery Drink and Mystery Girl ceremony. It was only natural that they work their favorite Polynesian restaurant into a Tonight Show sketch. The black-and-white clip shows Carson being served the drink by a Mystery Girl live in the studio, but only after the network censors insisted that it include no alcohol, according to Glazner. But as the legend goes, a healthy dose of 151 rum was added just before it was served, enhancing the hijinx that were to follow. The symposium included many other vintage clips, audio interviews and insider stories. Glazner has been invited to return to The Mai-Kai for a reprise, possibly during the 56th anniversary celebration at year’s end, and he promises even more recently uncovered information. And he’s also hoping to parlay his research into a book documenting the history of The Mai-Kai. If there are any publishers out there reading this, we suggest you discuss this project with Swanky over a drink. Preferably one served in a giant bowl by a Polynesian maiden after the ringing of a gong. That should seal the deal. 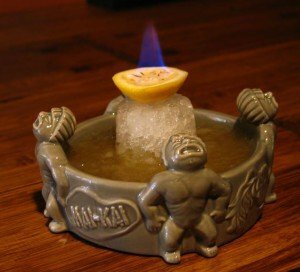 This entry was posted in 2012, Cocktails, Cocktails, Culture, History, History, Hukilau, Mai-Kai and tagged Hukilau, Mai-Kai, Mini Mai-Kai Mystery Bowl, Mystery Drink, Mystery Girl, Swank Pad Productions, Swanky. Bookmark the permalink.